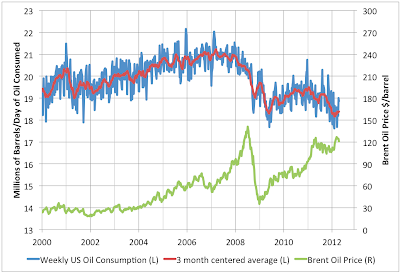 The chart above shows weekly US oil consumption since 2000 as the blue curve (the EIA weekly product supplied series). I have added a 13 week centered moving average (red) to cut the noise a bit. Both of these are on the left scale in millions of barrels/day (not zero-scaled to better show changes). 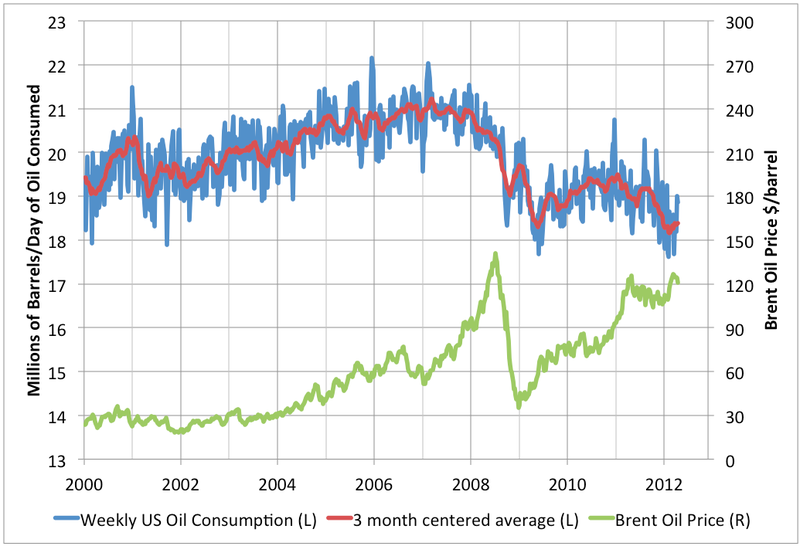 Then the green curve is Brent oil price (right scale). There's a couple of points worth making here. I have a very rough rule of thumb -- now that we are on the oil plateau -- that if US consumption is increasing, oil prices are below the required level. US consumption must decrease overall to accomodate rising consumption in the developing world, and stagnant supply. Since the beginning of 2011, oil consumption has been decreasing, suggesting that oil prices are in roughly the right range. However, it's also worth noting that the price required to make consumption decline has increased over time. In 2006-2007, prices of around $70 were enough to make oil consumption flatten and then decline. However, in late 2009 and 2010, similar prices obtained while consumption continued to rise. It took the rise to over $100 in spring 2011 to get consumption to start to decline again. Thus it seems likely that at some point, higher prices will be required to get US consumption to continue to decline. As usual, timing is hard to determine. This analysis is incomplete without including changes in GDP. When the economy is declining, a lower price will be necessary to reduce consumption. The economy has been recovering. So, I'd say it's premature to conclude that a higher price has been required lately to cause consumption declines. Long-term elasticity is much larger than short term: it takes time to plan and implement a conversion of your truck/taxi fleet to NG/hybrid, a transfer of your freight from trucks to rail, or a rail double tracking project to accomodate more demand. The key question, of course, is political: will the oil industry continue to succeed in hiding the very large external costs of oil, and manage to block higher CAFE, and the conversion to HEV/PHEV/EREV/EV?? Looking long term, one still needs to consider the huge impact of technology and the ability to extract "tight oil" in the States. There was a facinating post on the subject from Steve Levine in FP - http://oilandglory.foreignpolicy.com/posts/2012/04/24/a_disruption_for_china_and_the_rise_of_small_nations. Am not an economist and certainly no expert on oil to GDP ratios and the like, but it seems highly probable that over a longer time frame new technologies will make an impact. I also read somewhere that the IEA now has dropped its prediction on the oil price in 2015 (or it may have been 2020, forget which) from $120 to $100 due to new oil supplies.